Italy’s Cinque Terre is a bit like a beauty pageant, with one village after another competing to have the most charming backstreets, the cutest pastel buildings and the most Instagrammable views. Just when you think you’ve found the most beautiful spot, another one comes along and blows you away again. But like real-life beauty queens, each of the five villages has its own different charms. Some are showy and others are a bit more subtle – like Corniglia. It might not have Monterosso’s beach or Riomaggiore’s colourful harbour, but it has its own understated beauty – which is why I chose it as the base for my trip to the Cinque Terre. There’s no such thing as a completely quiet Cinque Terre village, but Corniglia is as close as you can get. It’s set in the middle of the five villages, and has managed to keep a more laid-back, local feel than the others by being the hardest to get to. The other villages have harbours and a boat service which shuttles visitors from one to the next. 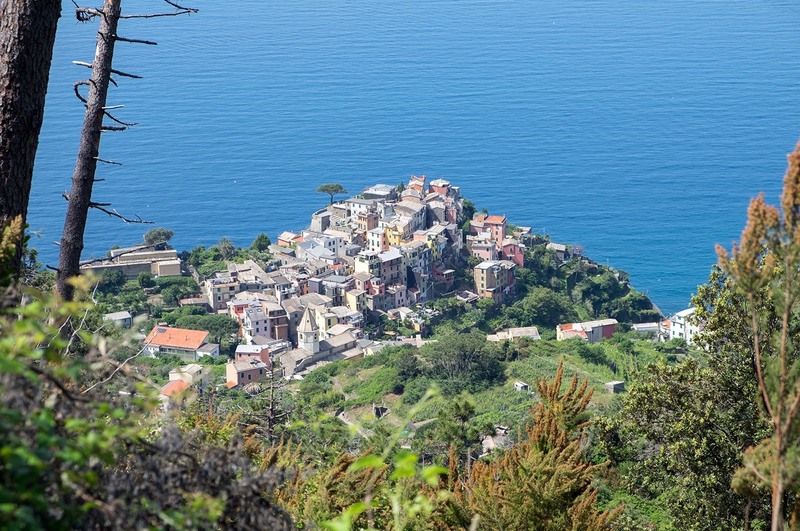 But Corniglia is perched up on high with no sea access, so the only way you can get there is by train or on foot. And even if you do catch the train, you’ve still got to climb a flight of 380 stairs to reach the village centre from the train station (it’s either that or brave the shuttle bus queue – an even scarier prospect). 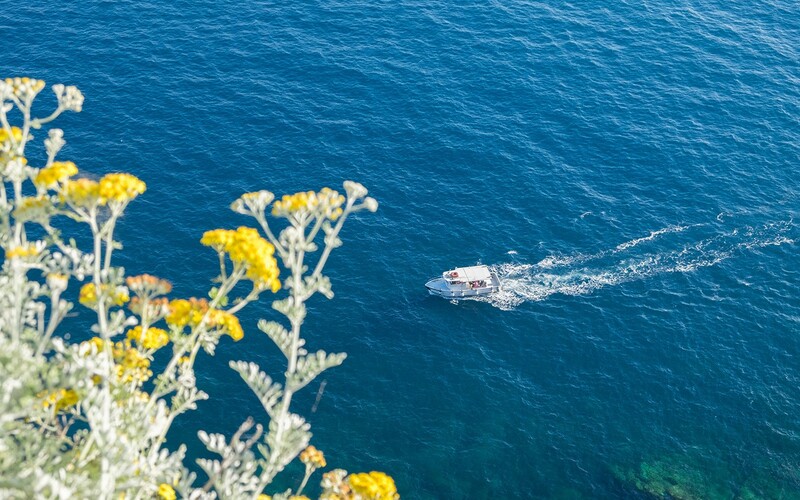 For visitors who are just here for a day or two and are pushed for time, the extra effort involved means Corniglia is the first to be knocked off the to-visit list. 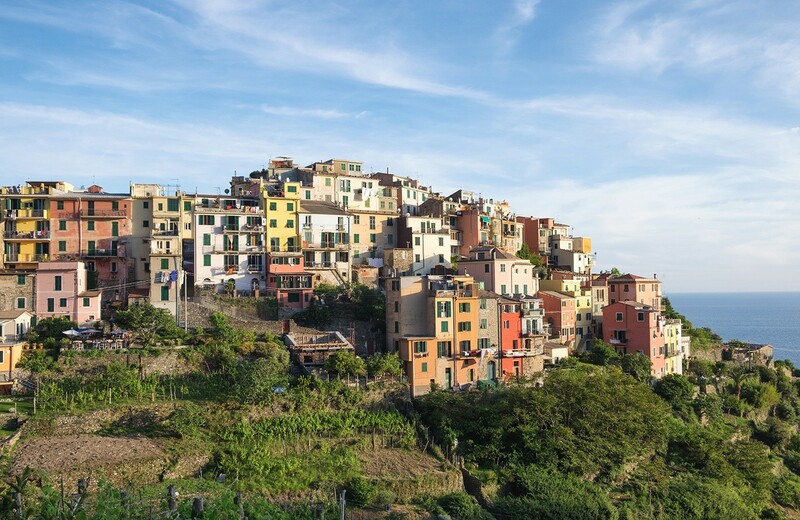 But if you do make the effort to visit Corniglia, your prize is a quieter, less commercialised Cinque Terre village, with little bars and restaurants tucked into cobbled streets and a knockout coastal view. That’s not to say there isn’t a constant flow of people passing through during the daytime. But come late afternoon everything slows down and Corniglia retreats back to its naturally sleepy state. It’s not even true that you can’t get to the sea in Corniglia either – there’s a tiny cove below the village where you can swim off the rocks. Though this being the Cinque Terre, there is of course a huge flight of stairs to tackle to get down there. 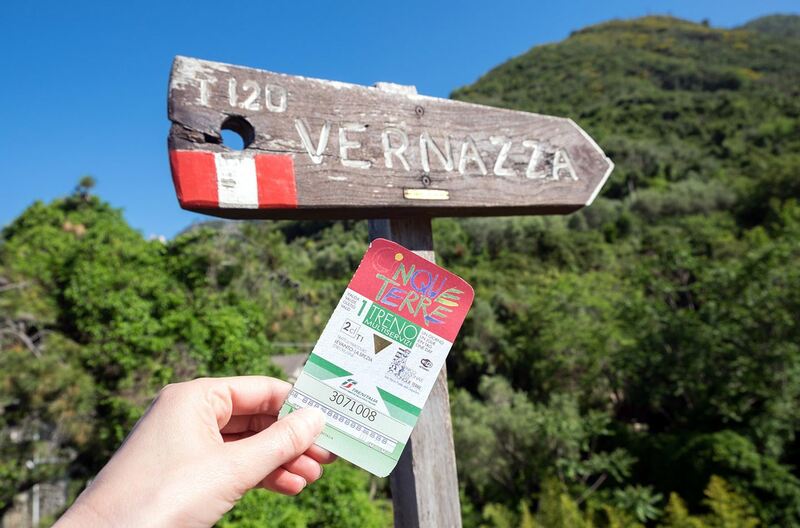 Being right at the heart of the Cinque Terre meant we were in the perfect position for walking, with two villages in each direction – Vernazza and Monterosso to the north, and Manarola and Riomaggiore to the south. Theoretically you could walk the whole of the Cinque Terre in one day if you started early enough. But we took it easy, spreading it out over two days and soaking up the views (and a few Aperol Spritzes) along the way. First up was the walk north of Corniglia along the coast path – you need to buy a permit for this section which costs €7.50 for one day (or €16 with train travel). Walking the coast path involves climbing more hills than you’d expect from its name. But starting in Corniglia means you’re already well above sea level so there’s less of a climb to do, and if you start early in the morning the paths are fairly quiet. 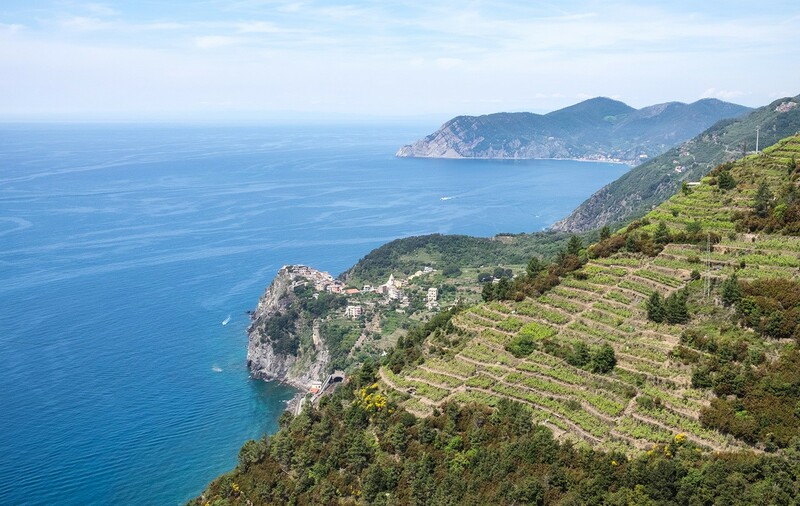 For most of the way the path runs across the side of the steep hills which overlook the coast, teasing you with just one more corner to go around until you get your first view down to Vernazza. Then from there it’s another couple of hours on to Monterosso where we cooled off our feet with a dip in the sea. In the other direction, there was a flat, easy coast path that ran along the water’s edge to Manarola and Riomaggiore. 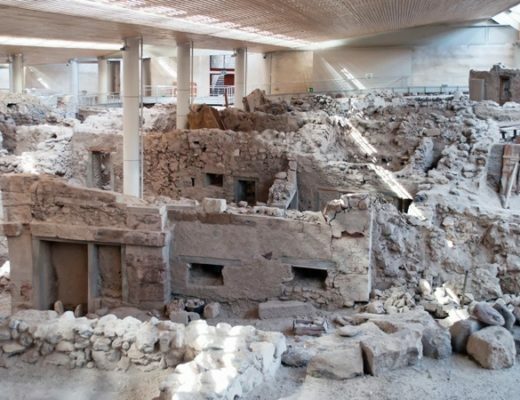 But it was damaged by landslides in 2011 and isn’t planned to reopen until 2021 at the earliest. So instead of a 45-minute stroll you have to work a lot harder and take the high path up through the hills. It took us almost three hours to make it to Manarola, starting with a steady 45-minute climb until Corniglia looked like a tiny model-sized village way below us. The path runs high up through the Cinque Terre vineyards then way back down to sea level again, before climbing back up to the hills for another two hours to Riomaggiore. The Cinque Terre’s train network makes it so easy to get around that it doesn’t matter too much where you’re staying as you can easily get from one village to another. But there was something really nice after a day of battling through crowds of people to come back to Corniglia where we had space to relax. Our apartment came with a roof terrace where we’d sit and watch the sunset over the coast each night. Sitting out there in the evening with a glass of prosecco we almost felt like we had the Cinque Terre to ourselves – even if it was just for a few hours. There aren’t any hotels in Corniglia, but there are a few small guesthouses and apartment rentals in the village. We stayed in an apartment from Il Caruigio di Corniglia, who have a few different places in the same building plus a couple more around Corniglia. Our apartment (BILO3) was on the second floor, with one bedroom plus a sofa bed in the lounge. It cost £149 per night for four people, booked through AirBnB (save £25 on your first AirBnB booking with this link). We had a little kitchen so we could cook dinner a couple of evenings, with our own balcony as well as the shared one on the top floor. Owner Lidia knows everything there is to know about the Cinque Terre and gave us piles of maps, train and boat timetables. There are three little grocery stores in Corniglia, selling a limited range of fresh produce as well as bread, pasta and wine. Each of them was a better for some things than others, so we usually ended up popping into them all (not too much of a problem as Corniglia is so small). If you’re stopping off in Corniglia for lunch, Pan e Vin and KM0 both do good foccacias and pastries – KM0 also does gluten-free paninis and stocks some gluten-free products. 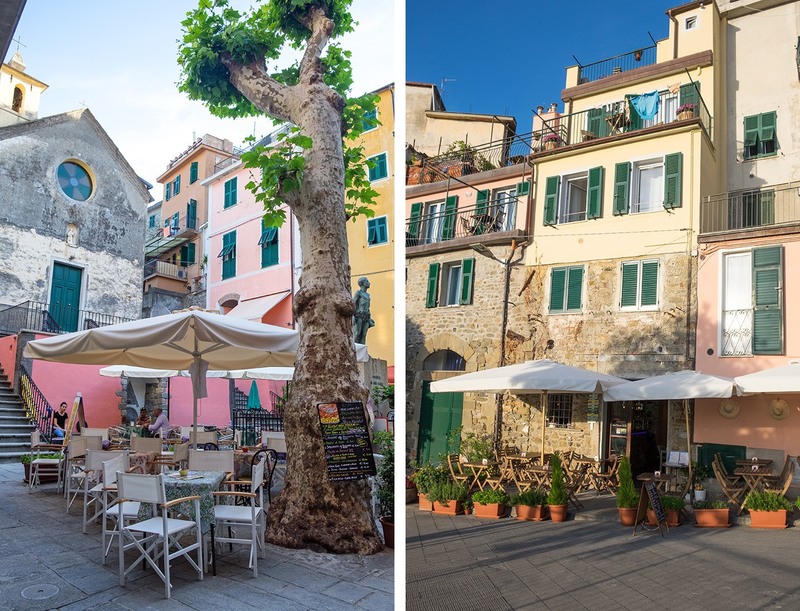 For a little village, Corniglia has plenty of places to eat. A few of our favourites were Food and Sea in the main square for pasta, pizza and fish. In the village, the tiny Cantina De Mananan only seats about 20 people so it’s a good idea to book in advance for traditional dishes. 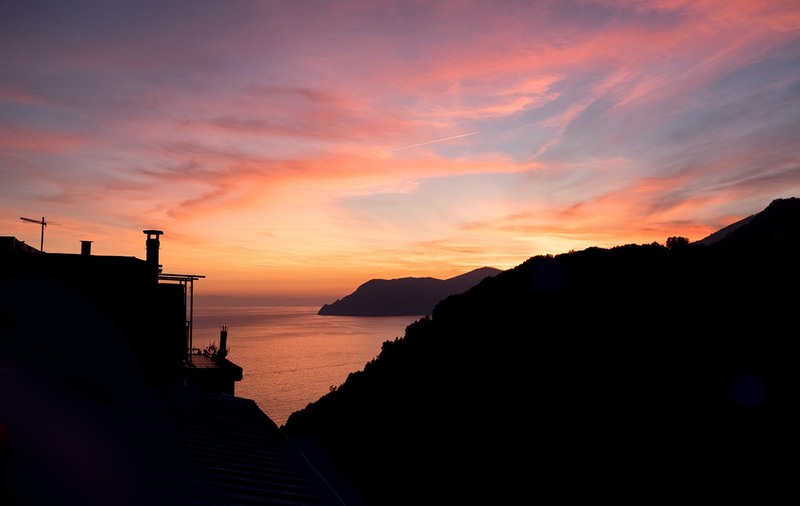 Or at the top of the stairs from the station, La Posada has a big terrace with a panoramic view to Manarola. There are a good selection of places for drinks too. 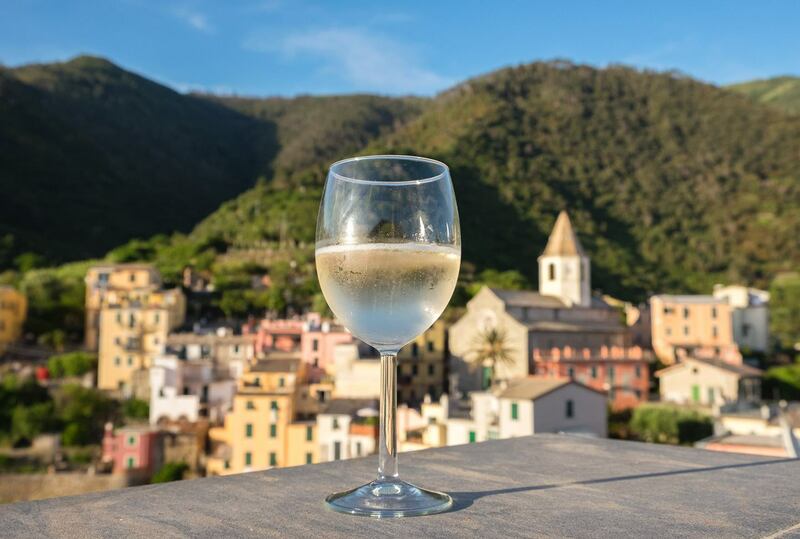 Bar Terza Terra has another stunning view with a just a few tables overlooking the sea – walk right through the village until you reach the viewpoint. 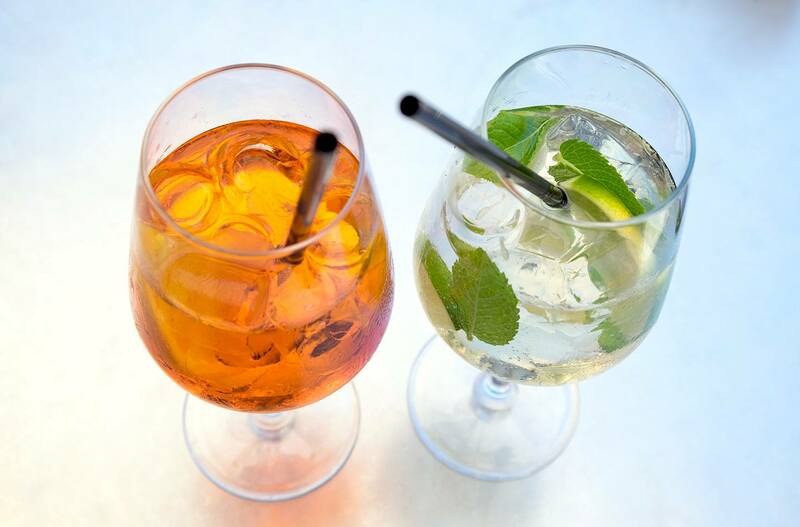 Or Enotica Winebar has a lovely little garden with colourful lanterns and flowers, and does a mean White Spritz – a twist on an Aperol Spritz using limoncello instead of Aperol. And don’t miss a gelato from Alberto Gelateria, where we worked our way through a couple of flavours each night. They also do a refreshing icy granita made with local lemons. Thanks Jo, it was so lovely up there, we did sunset there every night! There still seems to be a lot of damage from the landslips – and not a huge amount of work going on while we were there – so I’d be surprised if it’s ready to reopen even next year. Your description of Corniglia actually really intrigues me, and should I come to Cinque Terre one day, I think I’ll also choose the village as my base for all the reasons you mentioned. I need to work out a little bit though, so walking to the other villages won’t be too strenuous. Looks like you had a great time there as well as great weather! Thanks, it’s a great spot for a trip to the Cinque Terre. I’m not hugely fit and my parents came along and didn’t have too much trouble with the walks – though it did get very hot so we tried to start early, or if you were there later or earlier in the season it might be easier. Great post. Love the aerial view of Corniglia!!! Thanks, it was worth the huge climb to get that view! I know an area up the coast around Ventimiglia really well and so I thought I had a good handle on where to go around it, but I have not been to Corniglia and your pictures are so idyllic I’d like to go next time. Ventimiglia was our last stop before we got to the Cinque Terre (which I will write about eventually too!). Such a lovely stretch of coastline along there. 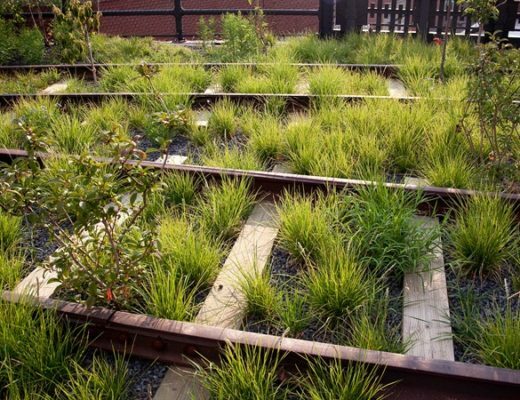 Hidden gems are always the best, and you don’t have to look far from the tourist traps! This is a bit like St Paul de Vence which is overrun with the sleepy Peillion and Peille just a short drive away and unknown to tourists! Funny how a couple of places so close together can be so different! The villages all had their charms but I was definitely glad to escape to our peaceful corner in the evenings. It is years since I visited Cinque Terre. Long before I started blogging and I’ve longed to go back there ever since. It is one of the most charming corners of Italy so it’s no surprise it is now so busy. I stayed in Portovenere, the next town along from Cinque Terre and we caught a boat to visit all the villages. Corniglia, though, does sound like an excellent place to base yourself despite the stairs. Sounds like you’re due a return trip then! We went to Portovenere for the the day while we were there and it’s a lovely spot too – such a pretty coastline in this part of Italy. 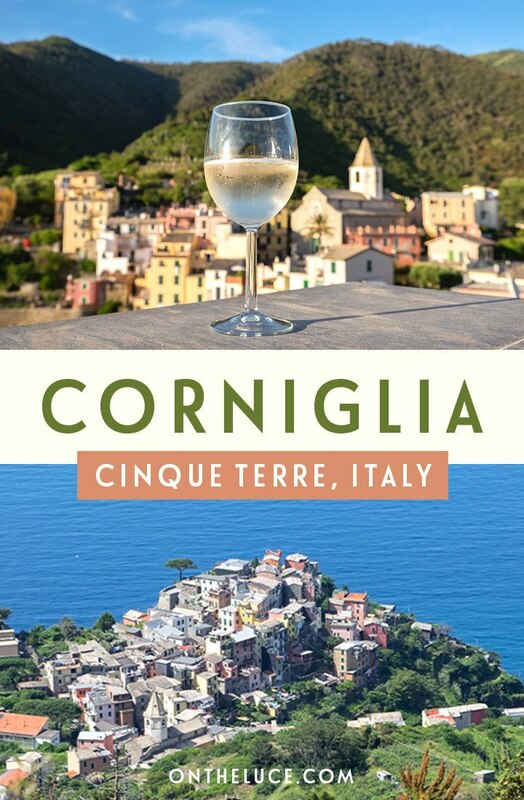 I think I’d opt for Corniglia as a base too – it seems the most logical choice! 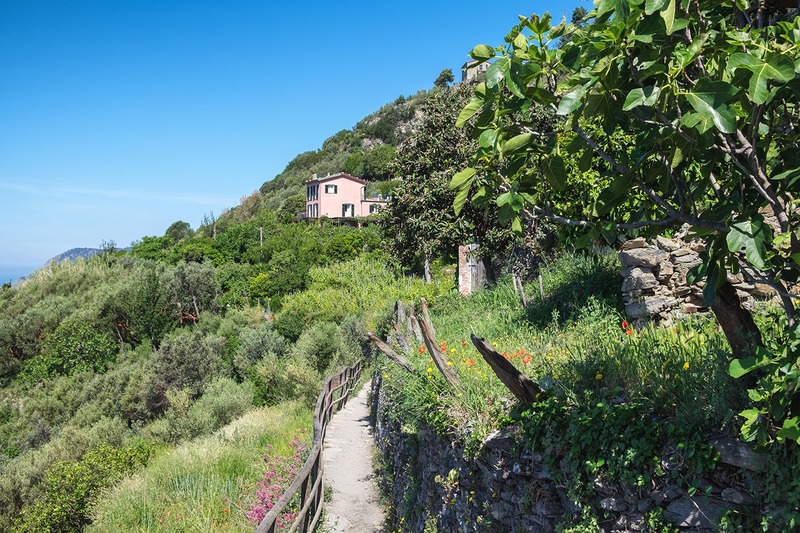 What does intrigue me is why the path to Manarola has been in disuse for so long – I’m sure tourism must be a key source of income for the area so I’d have thought mending it would have been a priority. I did wonder that too – there didn’t seem to be a lot of work going on while we were there and there’s still a lot of damage. Though I guess it’s not put people off visiting so they don’t need to rush too much! Such good walking, and some lesser-known trails up in the hills too which don’t get anywhere near as many visitors. I am one to search out the hard to get to spots. And you’re absolutely right, it does keep them a little more special,so I think Corniglia is a perfect choice. How wonderful to be able to walk by connected paths. Haven’t had the pleasure of Cinque Terre yet, but certainly hope to soon. 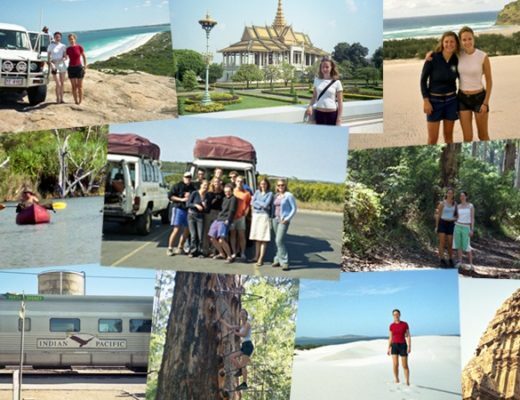 It really is one of those places that’s worth the hype – the walks and views were fantastic! I haven’t been to Cinque Terre in years, but it’s still as beautiful as ever! It’s such a stunner – postcard views everywhere you look!